Morry Schwartz, publisher of The Monthly and Quarterly Essay, is set to launch a new weekly newspaper called The Saturday Paper early this year, proving that print media is far from dead. If anything, he and Erik Jensen, the Paper‘s Editor, argue that it’s the shift away from print media that has led to a decrease in the quality of journalism. 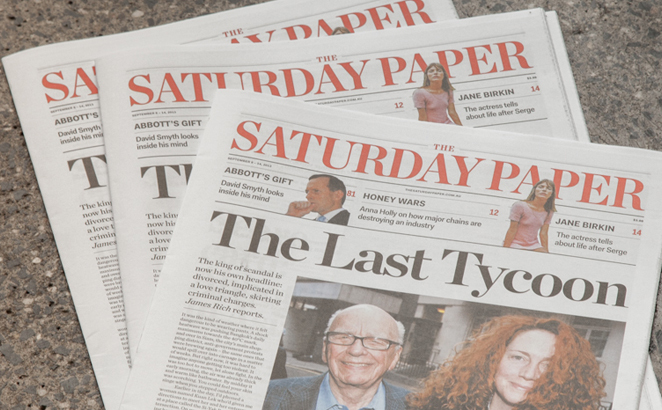 Continuing on in the tradition of its sister publications, The Saturday Paper seeks to make up ‘for a lack of quality and diversity in Australian journalism’, and will focus on in-depth investigations, feature stories, analysis and arts and culture. According to Editor Erik Jensen, the quality of journalism has suffered as a result of the ever-quickening pace of the online news cycle. Currently there is much more of a focus on quick, fast news, and less on digging deep into the facts. Jensen, a former Fairfax Media journalist and Walkley Young Print Journalist of the Year, left his job at Sydney Morning Herald to move to Melbourne and spearhead the project. He may only be 25, but he certainly has Schwartz’s respect. The Saturday Paper to set to publish 48 issues a year, and will be available in Melbourne, Sydney and Canberra. I for one can’t wait to see the paper launched. After so much uncertainty, here’s to what looks like a brighter-looking future for print journalism. The Saturday Paper will be launching soon. Find out more here.